Private Dining and Parties are available 7 nights a week, plus Weekend Lunch! 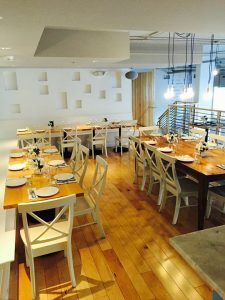 Our private and lively spaces are perfect for birthday parties, rehearsal dinners, business gatherings, and more. Click here our Sample Menu to see a recent rehearsal dinner we did. We have multiple seating areas: private mezzanine, bar, and dining area for a truly unique and party atmosphere. Come celebrate your night at Omega. Scroll below to see our spaces and then send us your info through the “Book an Event” or call Rebecca at (206) 257-4515. The Mezzanine overlooking the open restaurant has a private bar, stairs and elevator access, with bathrooms located just outside the room. The Wine Bar, the heart of the Ouzeri experience, is open to the restaurant but can feel like its own room with the dividing bench wall. 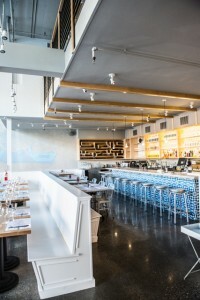 Your guests will feel like they are in the heart of Athens, with marble bar and table tops, Tsipouro and Ouzos on display, and a unique Greek only wine list with 80 plus bottles.Two booths fit 4-5 easily, four tables seat 16, and the bar can seat 14, for a total of 40 guests. Available for Happy Hour 4-6 and during dinner hours 5-10. With floor to ceiling Nana Walls, this bright and open space is perfect for a large party of 50. We can push tables together to go family style or guests can float about hopping from table to table. Open to the kitchen and the bar, the dining space is its own form of entertainment. Our outstanding space, food, wine and service will be an outstanding backdrop to your special celebration. Opa! 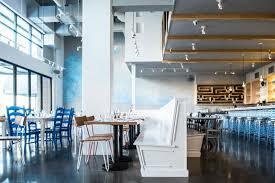 Diningroom, Bar, and Mezzanine offer the ultimate Greek party experience. All three spaces are open to one another and offer a fun and lively ambiance to your celebration. 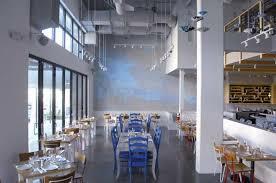 Our Greek chef/owner, Thomas Soukakos, will be hands on in helping you design the perfect food and drink pairings. I planned a surprise birthday party for my wife here and it exceeded expectations on all levels! Thomas and Rebecca were incredible to work with and had a “we can do anything” attitude the entire time. The mezzanine was perfect for our party of 25 and the service was impeccable. Now let’s get to the really good stuff- the food and drinks! We went to Greece this summer and had been craving authentic Greek food. Not one plate that we ordered left us disappointed. The mezethes allow you to try just about everything…and you should try to also! We also had three specialty cocktails that everyone loved- The Olive Oil Martini (smoothest martini ever), the Mastiha Dream (light and refreshing), and the Ouzito (a must if you really want to indulge in Greek culture! ), wine, and Greek beer. If you are looking for fun, family, and great Greek food…this is your place!! !